Both mineralogy and geology began as macroscopic observational sciences. Toward the end of the 19th century, theoretical crystallography began to examine the microscopic consequences of translational symmetry, and with the advent of crystal structure analysis at the beginning of this century, the atomic (crystal) structure of minerals became accessible to us. Almost immediately, the results were used to explain at the qualitative level many of the macroscopic physical properties of minerals. However, it was soon realized that the (static) arrangement of atoms in a mineral is only one aspect of its constitution. Also of significance are its vibrational characteristics, electronic structure and magnetic properties, factors that play an even more important role when we come to consider the behavior of the minerals in dynamic processes. It was as probes of these types of properties that spectroscopy began to playa significant role in mineralogy. During the 1960's, a major effort in mineralogy involved the characterization of cation ordering in minerals, and this work began to have an impact in petrology via the thermodynamic modeling of inter- and intra-crystalline exchange. This period saw great expansion in the use of vibrational, optical and Mossbauer spectroscopies for such work. This trend continued into the 1970s, with increasing realization that adequate characterization of the structural chemistry of a mineral often requires several complementary spectroscopic and diffraction techniques. The last decade has seen the greatest expansion in the use of spectroscopy in the Earth Sciences. There has been a spate of new techniques (Magic Angle Spinning Nuclear Magnetic Resonance, Extended X-ray Absorption Fine-Structure and other synchrotron related techniques) and application of other more established methods (inelastic neutron scattering, Auger spectroscopy, photoelectron spectroscopy). Furthermore, scientific attention has been focused more on processes than on crystalline minerals, and the materials of interest have expanded to include glasses, silicate melts, gels, poorly-crystalline and amorphous phases, hydrothermal solutions and aqueous fluids. In addition, many of the important intereactions occur at surfaces or near surfaces, and consequently it is not just the properties and behavior of the bulk materials that are relevant. This is an exciting time to be doing Earth Sciences, particularly as the expansion in spectroscopic techniques and applications is enabling us to look at geochemical and geophysical processes in a much more fundamental way than was previously possible. However, the plethora of techniques is very forbidding to the neophyte, whether a graduate student or an experienced scientist from another field. There are an enormous number of texts in the field of spectroscopy. However, very few have a slant towards geological materials, and virtually none stress the integrated multi-technique approach that is necessary for use in geochemical and geophysical problems. I hope that this volume will fill this gap and provide a general introduction to the use of spectroscopic techniques in Earth Sciences. I thank all of the authors for trying to meet most of the deadlines associated with the production of this volume. It is my opinion that the primary function of this volume (and its associated Short Course) is instructive. With this in mind, I also thank each of the authors for the additional effort necessary to write a (relatively) brief but clear introduction to a very complex subject, and for good-humoredly accepting my requests to include more explanation and shorten their manuscripts. 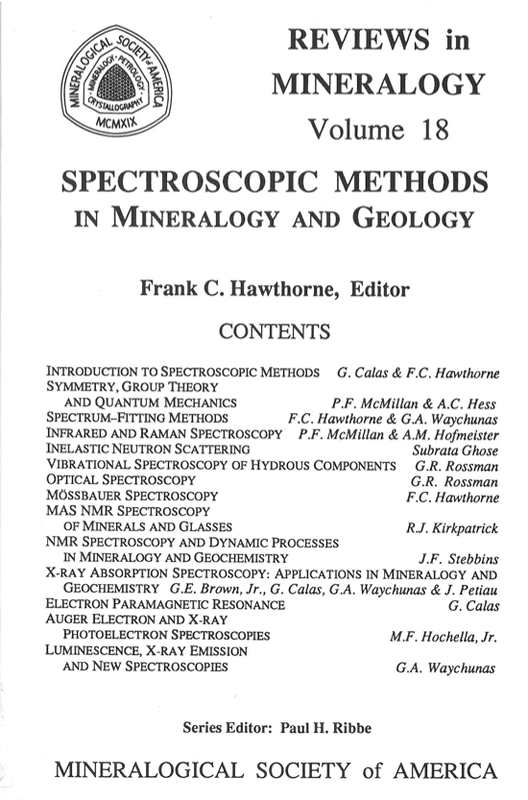 The authors of this volume presented a short course, entitled "Spectroscopic Methods in Mineralogy and Geology", May 13-15, 1988, in Hunt Valley, Maryland. The course was sandwiched between the first V.M. Goldschmidt-Conference, organized by the Geochemical Society and held at Hunt Valley, and the spring meeting of the American Geophysical Union, held in Baltimore.